Marijuana prohibition has taken yet another innocent life. 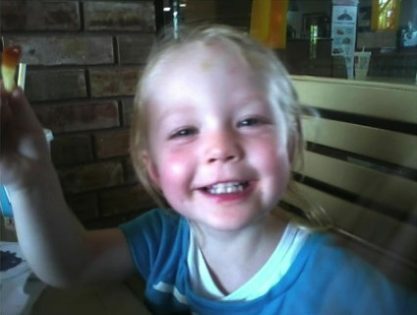 In January 2013, two- year-old Alexandra Hill was taken from her home in Round Rock, Texas because her parents had admitted to smoking pot after their child had gone to bed. As a result, she was placed with an abusive foster mother, who subsequently beat her to death. According to her father, Joshua Hill, who spoke with KVUE, a local ABC affiliate, “She would come to visitation with bruises on her, and mold and mildew in her bag. It got to a point where [he] actually told CPS that they would have to have [him] arrested because [he] wouldn’t let her go back.” A few days later, the Hill family got a call informing them that their daughter was in a coma, and they needed to get to the hospital right away. Two days after that, Alex was taken off life support. Up until she was snatched from her family in January, the 2 year old had never been sick or gone to the hospital. “When a parent who responsibly consumes marijuana after hours is seen as neglectful in comparison to a parent who responsibly enjoys a glass of wine, then the system isn’t just broken, it’s deadly,” said Sabrina Fendrick, Director of Women’s Outreach at NORML. Little Alex’s fate was sealed the minute the Department of Family and Protective Services (DFPS) determined that such behavior qualifies as “neglectful supervision,” and put her with a foster mother who had not been given a proper background check. This is just one more tragic casualty of marijuana prohibition. However, the practice of child snatching by CPS from marijuana-using parents is by no means unique to this story. Current policy gives state agencies the right to legally kidnap minors and infants from their loving parents’ home (simply for the fact that they are cannabis consumers), and place them in an unknown, possibly dangerous or truly neglectful environment. Hundreds of similar CPS cases pop up around the country every year. Only when the government changes its view, and policies on marijuana can we truly protect the rights and integrity of good parents who responsibly consume cannabis after hours and out of their child’s view. It’s time for CPS, the state of Texas and the federal government to step up, take responsibility for all of the damage they have caused, and commit to ending this disastrous and fatal policy. I hope that everyone one involved at CPS and the foster criminals are put away for life…and I’m trying to be nice. I cannot put into words how angry this story just made me. As a father of a young child, I am utterly disgusted that this completely avoidable tragedy was allowed to happen. THIS NEEDS TO STOP NOW!! HOPE THE CPS GETS CHARGED WITH NEGLECT This goes to Show how SCREWED UP OUR JUSTICE SYSTEM IS..
O am glad I am not the father, because I could not live without killing someone. This is just such a miscarriage of justice! How they can a child out of an ‘unsafe’ environment without thoroughly investigating the foster home! That’s CPS for you! I’ve had more dealings with them than I care to share. They are bigots!